The story of the Guardrail is similar in many regards to Bunyan's The Pilgrim's Progress (which was is a great story) but more rudimentary and far less dependent upon faith and the numerous antagonists. The story is both pre and post Abramic. And they are not trying to get to any Celestial City. The path merely leads to Clarity which by virtue of each other they eventually discover to be within themselves along with serious potential darkness. The antagonists are merely Obfuscation, Extortion, and Presumption being used by a Dark Lord, all eventually discovered to be complimentary to forming a life of clarity and brotherhood, as they inherently instill a mutual understanding of the true needs of Life, Wisdom, and the Staff of Truth, without which one becomes lost in dark clouds of confusion and unnecessary harsh thickets, dangers, dark lords, the misleading possibilities; "temptations" and "snares", and mistaken impossibilities. The moral of the story involves the importance of forming ones own immutable staff, sharing burdens and easements with intimately known friends, and keeping authority local among those who are aware of the details of their lives while still keeping in trustable contact with others – God is local, as in literally everywhere, hidden only by ones own blindness. In essence, they each learn to walk carefully and considerately using their staffs as a guide - "Walk softly and carry a big stick". As a group, they each learn to "see in the dark" first slowly by feeling their way, then by using a staff, then sharing their staffs, burdens, and easements, then by communicating with their staffs such that they became more broadly certain of the larger terrain. And once they become certain by such a means, founded upon certainty of indubitable truth constantly being honed by the antagonists, they can see quite clearly in the dark, thus they find clarity and no longer darkness … for them. I am tempted to tell a long allegorical story of a man who was on the right path but within a dark cloud and lost his way into the harsh thickets of life. In his struggles he gained experience, mostly concerning a guardrail that he could not doubt nor persuade. But the guardrail was covered by the thickets and made his journey very difficult, but at least reasonably certain. There were others struggling all around him both asking and offering advice, seemingly just as blind as he. Finally, getting old and progressing so very slowly with each step, he doubted even that the guardrail was really leading him in the right direction and even if there was a right direction at all. After quite a while of struggling to reach for and verify that the guardrail was still close, the man thinks to make himself a long stick with which he could reach through the worst of it and feel for the guardrail. He found his first attempt, although partially successful, was a bit flawed because the stick wasn't hard and straight enough to clearly discern the guardrail from a mere tree stump or thick limb. But finally, he very expertly carved out a very solid and hard staff that he could thump against the guardrail and by the sound and feel, he could clearly know the difference. The staff turns out to be the Staff of Truth, formed straight and hard so as to reveal the sound and feel of "Hard Knocks" without having to experience them directly. After quite a while of arduous journey, with many people struggling by in their own plights, the protagonist encounters another older man seemingly going at the same pace and waiting for the protagonist each time he stops to reach for the guardrail. They share their experiences and find that they have a common understanding of the difficulties in modern life. Eventually, the man asks of the protagonist how he knows that he is on the right path at all. The protagonist tells him of the guardrail and his staff and then asks the man how it is that he knows. The replies, "Oh you seemed so certain that for quite some time I have just been following you". They chuckle a bit and continue. After a while, the man with the staff realizes that comparatively, he is doing all of the harder work while the other man stays further away from the thickest entanglements. They discuss and agree that it is only fair that they swap now and then so as to share the burden. And that seemed to work for a while before the protagonist realized that again he could just form another staff and walk even further away from the guardrail into still clearer territory by regularly reaching his new staff in and having the other man tap on it after verifying the guardrail. And by swapping positions, they reduce their average struggle even more. And so they proceed. Before long, they realize that there seems to be several other people around them following along. They discuss the staff and guardrail strategy but find that most others would rather just tag along and not be obligated. Some of those following along always stay even further away from the worst of the thickness and have much less struggle than those doing the work. So the two men with the staffs begin to cast doubt to the others that their method is really working and cleverly let be believed that they are really just faking it. With that, many of the struggling followers decide to just wander on their own. But eventually one of them offers to help as long as he was permitted to verify that the guardrail was really being tapped and guiding the way. That was easy to agree with because in order to do that, he had to do the tapping himself and thus share the burden. After initiating the new guy, the protagonist realizes once again that he could simply make another staff and extend even further away from the entanglements at least one third of the time. And upon doing so, he finds himself standing in very clear terrain. That was quite a delight because it was the first indication that the guardrail was really following the path and not merely wandering through endless woods. But shortly the thought occurred to the men that perhaps the relative clearing was not the right path, but the ill famed wide path that leads to nowhere and all this time, they have been on the wrong side of the guardrail. Perhaps that is why the guardrail was there, so as to prevent those on the other side from having to struggle as they have been. That became quite a concerning issue. So the men devised a plan to hold up for a while so that one of them could cross the guardrail and see if things were better over there. But there was rumor that there might be a sudden obscure drop-off and that was the real reason for the guardrail. The protagonist, knowing his staff really well, realized that he could use it to simply tap the ground before placing his weight on it to ensure that he was always standing on solid ground. So the men and a small portion of their entourage who didn't lose faith in them due to their quandary, waited while the protagonist ventured a short distance across the guardrail. Upon returning from a very short venture, the protagonist announces that sure enough, there really is a drop-off and the thicket is even worse, extending out from the cliff and thus seriously dangerous. They began on the journey again, confident that they were at least on the right side of the guardrail until one of the passersby scoffed at them for believing that old man and asking how they knew that he wasn't merely a trickster out to gain a following. The men thought about it and didn't really doubt, but the protagonist remembered the make of his staff. He realized that it was for sake of certainty that he made it so hard and ungiving and if they were to begin merely believing the word of one member, there was room for doubt and uncertainty that they seriously had no room for in their lives. "We have gone this far because we each understand the issues of being in the dark as we are. And have become of one mind to depend upon only that which is immutably certain to each of us. It isn't an easy way, but it is the only way we have gained the ability to share our burden and ease our struggles. We cannot let faith in each other open the door to doubt and even more darkness". So they all waited even more for each member to verify what they were already certain about. Each having discovered the truth of the drop-off reordered the group and began restarted their journey. They found that many of their followers had wandered off and felt endeared to those who hadn't. They felt a degree of joy and confidence that they hadn't felt since their youth. But with their anewed confidence, their minds opened up a little more and found a concerning thought. One of the men casually asked, "How do we know that this isn't the famed wide path that leads to destruction and we are perhaps merely following its border?". That was a disturbing thought and the protagonist out of a hope filled heart quickly proclaimed, "No. I am certain that this is the right path." But then one of the men reminded him of his own words concerning certainty, one mind, and leaving room for the devil of doubt. The protagonist wanted to argue but really couldn't. And pretty quickly realized what would have to be done. Again they stopped. This time to wait as they formed a chain of staffs from their current position in the relative clearing out across what they believed to be the right path. They first discovered that the path got even more clear with even more people wandering up and down chattering away, many of whom were talking of how easy life is and their being no need to worry regardless of the darkness. They would often say, "Merely have faith". The men wanted to believe those voices, but could tell that very few others were really listening and doubted that those preaching knew what they were talking about. So many voices were always saying that this is the way or that is the way and just have faith in them. But the men could see no reason to have faith in any particular one of them and they each preached a slightly different direction. So the men held to their plan and extended their little staffs still further across the clear path until they found it to become cluttered again. And gaining a new member in their effort and wanting to be extra certain, they continued even further into more dense thicket until they ran upon a very solid wall. At first it felt like another guardrail and declared it as such. But as each confirmed what the other found, they collectively discovered that it wasn't exactly a guardrail but rather a wall of rock extending far upward. And with that, they decided that they actually had no choice but to follow the path they had been on. Now confident and feeling a little foolish for spending so much time struggling when they could have just zigzagged across the clear path and stayed clear of the thicket entirely, they rested while thinking of giving up their silly method of testing the boundaries and just following the crowd. After their rest, they picked up again staying in the relative clear path letting people know that there was no need to doubt the easy path and advising the young to not wander far from it. They each explained how they had tested the path and were certain that it was the only and thus the right path. But the protagonist didn't feel good about saying such a thing because that wasn't really any different than all of those who had always told him to have faith when he was young. He knew that most of the young had no reason of their own to hold such faith regardless of his own certainty. The small group of men stayed together for quite a while as they reminisced and far more casually strolled in the darkness. Although relieved in many ways, they each found it a bit uncomfortable to just stroll along, seeming to serve no purpose and watching the young wander off into the terrain that they come to call "the way of hard knocks". After a while, the clear path that they had been following seemed to come to a widening and divide. Most of the wanderers couldn't tell that there was a choice and just kept going in whatever direction they happened to have been wandering. But the men had stuck together and thus immediately realized when one of them was inadvertently getting further away. They had to stop for a little while to decide what to do because they were now certain that both paths couldn't be the one right path. Of course others kept telling them that it didn't matter as long as they kept walking because life is merely about the journey not the destination, and any path is as good as another. And even though they didn't really believe that, they had doubted such people before only to waste most of their lives worrying for nothing. Being hardened men, they just couldn't feel right arbitrarily choosing a path with no guide. No telling where the other path would lead. So they made a plan. The protagonist thought that because one side of the path was apparently a mountain, if they stuck to that as their guide, they might get above the darkness and be able to see clearly. But one of the other men considered that perhaps the cloud was merely staying around the mountain and if they took the other path, leading away from the guardrail wall, it might lead down where the cloud didn't reach. So they decided to split up into pairs using again their expertise as sensing the terrain and figuring that if either ran into trouble or a dead end, they had the means to find their way back to the split. The protagonist made certain that each member clearly knew how to form a straight and true staff and they set out on their separate ways. As each group proceeded, they gradually acquired more staff members as well as followers. And when they had more than staff members enough to cross their path, ensuring to be centered, the extra, more seasoned staff members, would proceed ahead and eventually form another group such as to be able to leapfrog, allowing even greater average ease from the thickets. But they couldn't get too far ahead, else might lose track. Unknown to the protagonist, someone had gone far ahead and formed his own group. He began hearing about it from the loose wanders and wondered how he could somehow get in touch with them to see if he still needed to be testing the rails. But then he thought of that faith and doubt issue. Some strolled ahead and were never heard from again. And he began to wonder if perhaps the rumor of another group wasn't actually true because he was starting to hear of yet another group behind him that was heading in the opposite direction, also using staffs to guide their way. Perhaps they had been going in the wrong direction from the very beginning. That news and the occurrence of occasional road splits added even further doubt to their quest. Finally it occurred to the protagonist to make a train of staff carriers extending forward and behind with instructions to the lead carrier to join up with any next group he came across and use a tapping signal to relay what he had found. So there came to be two types of staff carriers; Probers and Relayers. And then official messengers who would merely walk the path of staffs carrying more detailed messages concerning the needs, abundances of resources such as food and water or extra help and sometimes of unusual dangers. Soon there was an entire network stretch along the clear path keeping everyone along the path informed as to what was ahead and behind, much like a column of ants with a primitive LAN, Local Area Network, feeling their way and communicating what they found. And not long after that the amount of information concerning the entire terrain of the path became complex enough to require some means to record it. The women, seldom suited to handle a staff began making tapestries as simple crude maps and the protagonist began to carve symbols on each new staff representing its make and route. And as groups coming from ahead and behind passed each other, information was exchanged concerning their journey. Not long after that everyone along the path had a pretty good idea of everything going on all around them and as the Protagonist was explaining the whole process to a new enthusiastic staff carrier, a women commented, "I don't see what there is to know that we don't know already." And with that, the protagonist realized how clear the terrain had become despite everyone still being in the dark cloud. The splinter groups who had taken divergent paths from the mountain path ran across more interesting problems. Although quite separate from the protagonists network, they too figured out who to communicate with their many small probing groups due to running across wise open terrains requiring a long chain of relayers and forests requiring much more careful probing and mapping, both of which became landmarks of fear due to the greater uncertainty. They all came to respect the thickets because those let them know of their immediate boundaries and gave them hope. In many regions as the staff probers took so long to verify each small move and with the networks working so well keeping everyone informed and fed, many felt that there was no need to keep moving out from the local territory that the children were instinctively learning. Each time to they moved, the children became a little unsettled, sometimes loosing their bearings and friends. After many had chosen to settle and let the staffers do the disciplined work, the settlers learned of their own local landscape far better than the staffers and begin to not see the need for such work. Often the children were quite happy with things just they way they were and began losing respect for the whole staffing concern. They would play small pranks on their friends and parents by moving familiar local landmarks in the dark so as to temporarily disorient and confuse. And that was the beginning of the most serious trouble the people had ever encountered. Some of those playing pranks were young adults, capable of making larger changes in the terrain that kept people fooled for quite a while and in some cases to their delight, they could make permanent changes in the maps. And as time went on, some got very clever in not only changing the map, but also the messages being relayed by the unwary staffers. The young, somewhat sinister adults began to form gangs and clans of the dark with which they would reroute supplies and alter messages to reflect negatively upon their enemies without anyone realizing they had done it, "Children of the Dark". And when they grew older, they didn't forget how to do such things. They considered the darkness their friend and became dependent upon it as a means to feed off of the efforts of others trying to gain clarity. Eventually the children of the dark became a serious problem for the staffers who were too often finding their messages had been altered and their maps no longer correct. People began losing faith in the staffers entirely and seeking more favor from those in the dark. As the staffers were debating the issue and what to do about it, they would seek exactly how these dark pranksters were getting away with what they were doing so that a means could be devised to prevent it. It seemed that everything they tried wouldn't last long before someone found a way around it. They felt that they were dealing with an intelligent dark adversary. And they were. The still darkness had bred the most clever adults who had formed their own means of secretly communicating so as to feed off of the unaware. And having gained such power, managed to gain the loyalty of several staffers as spies. And once the staffers had grown weak and uncertain of their own devices, the most clever leaders of the dark clans took over the entire staffers network. As the new leaders of the staffers, the dark lords spread misinformation messages throughout the land telling of how dangerous the dark pranksters had become and that something was going to have to be done. And to get rid of lingering disloyal or altruistic staffers, they used their dark way to cause them to be attacked by their own friends and family. Having secured their reign from the darkness, they arranged that there shall be laws given by the only true and trustworthy staffers. No other staff was allowed to exist unless it had their sacred official mark. All older staffs were to be burned. There was to be one order of staffers, united for the common good of all in the land. Of course many were not quite comfortable with the idea of laws and being commanded so the new lords found themselves having to compensate for a considerable amount of disrespectful citizens. So to simplify the matter, they armed many staffers with short hard staffs, called "rods", not to be used for probing and communicating in the normal way, but rather to serve as a disciplinary tools to communicate the hard knocks from disobedience to the guardrails of their lord and master. Even though that all seemed to be working for a while the resistance to their dominion seem to keep growing. They not only had to spot dissenters but also potential clandestine youth. They were greatly out numbered by the local populous and the locals knew their own region far better than the staffers. The people began to lose trust in the messages they were getting through the proper channels and often trapping a staffer with independent tricks. The new lord and master remembered how it was that he gained his power in the first place and became fearful that the same might happen to him, so he devised a plan. He realized that it was the confidence of the locals that was in competition to his authority. So he set out to remove their confidence by a variety of means such as to make them more dependent and loyal to him. He targeted any males who seemed confident in themselves so as to give them bad reputations as well as their children so that they would not grow up to become confident. He made learning more difficult and certainty almost impossible. And to ensure that they locals didn't have the advantage of local terrain knowledge that he had used, he organized messages so inspire the people to relocate from region to region due to some danger that he would arrange. Anyone found to be resistant to such changing would be labeled a mere coward, afraid of change. Of course it didn't take long before the people had to move again and there was only so much territory before they would get out of reach entirely, so he arranged that the fear messages formed a slow moving circle of movement such that by the time they returned to their former location, it would be modified and they would have forgotten too much to be confident. Ensuring that his was the only staff and declared the only source of truth, very few locals could tell that they were being led into an eternal circle and being intentionally kept in the dark, void of certainty. The very idea of clarity as a goal was disreputed as being a mere fantasy of those older prior generations who had led them into a dismal past merely to gain power over them. Even his own staffers had to look to him for the little clarity that was allowed. They believed that dark secrets were necessary so as to keep evil foreigners and dissenters powerless to disrupt their good reign. The older staffs were burned. Who was there left to argue? And who would hear them if they did? But this lord of the darkness was not the only clever soul in the land. There was another who knew what was happening and had held his tongue. And in the darkness arranged that the truth of the situation be remembered in a way that was so subtle and clever that it was as though every rock and every tree had the memory hidden within it. People kept showing up with stories of old that the dark lord knew to be true. He would of course target those people but was a bit puzzled as to how they knew. So being ever so obstinate in securing his power and dominion, he sought to destroy and replace the entire landscape with artificial landscape of his own make. The word was given that such terrain was the harbinger of malicious diseases and the product careless people endangering everyone and the new artificial terrain was better. But despite his extreme efforts, rumors that things could be better and used to be better kept rising. The dark lord knew of the mountain people out of his range and reign and suspected that such rumors were coming from them. So he arranged for a war, shifting blame onto the mountain people for all of the hardships of his own people. He spread the message that the mountain people were keeping the true wealth of the land to themselves and inspired a war against them. But the truth wasn't coming from the mountain people nor anything they possessed. The war gained him nothing. And as the rumors and dissenters kept rising, he chose to even be rid of his own people who were not certain to be loyal. He arranged for ways in which fewer people could accomplish more and thus needed fewer people in the land while gaining even more power. And in the darkness all who were not tested, profiled, and labeled to be loyal would vanish, never to be heard from again, especially the old and useless. With that thought, the dark lord could not imagine anything that could ever take his power away or reveal the truth of how he obtained it. He was certain of his own dominance through ensuring the uncertainty of all others. But the truth had been hidden by such a means that no matter how much destruction took place, how much artificial landscape was produced, and even with so very many people killed off, it would still make itself evident to those worthy to know it. So the effort of the dark lord was to ensure that no one was ever worthy to know it, and although he tried, he didn't really know how to do that. The truth was hidden by the dark lord's own blindness and anyone with merely his vision could never see how the truth could be revealed and thus couldn't devise a plan to prevent it. What dark lord had never realized was that the staffs of old were not merely relaying and carrying the truth, but also they were the very means to find it and more importantly, anyone could make a staff, all they had to do was ensure that it was hard and straight. And although not everyone knew how to ensure such straightness and hardness, it could hardly be hidden despite his many attempts. As long as there was anything crooked or soft, straightness and hardness was evident. Although he tried to declare that everything was crooked and not to be trusted, merely saying that implied that straightness must exist. And even among his own staffers, a much larger portion of the population now, faith in his own staffs came into question because it had been declared that even they could not be straight and could not be trusted. What he had used to ensure his power was the very thing rising to take it away as more and more people wondered if trust in straightness could be and should be found and respected. Although all prior guardrails had been either removed or replaced with artificial ones, they were still a guide, just as had been intended by the dark lord. But everyone knew that they were artificial, sometimes important and sometimes merely a ploy. So making a good solid and straight staff that would probe to a standing guardrail, although easy, didn't really tell of the certainty the path or of danger in the darkness. That situation played to the favor of the dark lord in keeping all people subdued in their doubt. What kind of guardrail could be trusted when it is known that they all are artificial and might or might not signal anything relevant? What could be more difficult to persuade than the impossible? Many of the staff makers, both staunchly loyal and not so much so began to wonder if there was a way to make a staff so perfectly straight and so very hard that only the impossible to move would register as a hard knock. And although it took quite a while, they found a way. Of course the loyalists immediately sought to destroy all such staffs, but they discovered a problem. Not only were the staffs extremely hard but they wouldn't burn. So instead they sought to be rid of anyone knowing of such things. And in return the staffers began to hide their immutable staffs inside the official staffs. More official staffs were being replaced by dual staffs with the immutable staff within. Those who knew of the technology could then distinguish the knock of something impossible from merely something hard. So as the official messages were relayed, so too was another message more subtle and more certain. After a while, there was exactly what the dark lord feared, an entire army of rebels hidden within his own camp and more certain of all they knew than he and communicating among themselves in what was complete darkness to him. From the impossible arose what could be trusted and from trust arose the possibility of the clarity in life so long sought. All of the methods and means of the dark lord who had arisen from merely the young pranksters were being recorded. And the most offensive of those were the obfuscating pranks themselves producing more darkness and the use of rods to ensure obedience to an official truth. So one was turned against the other. A new order arose based upon all that had ever been learned and the certainty of the impossible. Pranks became much more difficult and impossible on any large scale. New trust was established that superceded the dark lord's mighty voice and reign. It was found to be impossible to keep certainty and truth from all the people. And no distant official truth could ever replace locally established immutable truth. So authority was relinquished to local staffers using their own staffs after having been taught how to make them immutable. And pranksters were to be dealt with only by softened short rods not demanding obedience, but rather revealing a better path. Some pranks still took place, but all were considered just fun and a part of learning the reason for the staffs. From the humble beginnings of a few immutable staffers spreading their story and staffs, a mountain of immutable truth arose. Formerly unbelievable possibilities were discovered that had been under their nose the whole time. And at the peak of the mountain, the immutable wisdom of life was formed. The darkness was never forgotten because it was never completely removed, fore to do so or to forget the ways of pranksters and dark lords was found to be unwise lest the true needs of life and its ability to protect itself against darkness be also forgotten. And for the first time in all history, they were all of one mind. How does one know that he knows? - One of the most relevant questions in all Philosophy. The default presumption is to presume based upon intuitive probabilities. That is how people knew that the Earth was flat floating in a bowl of water supported by an elephant riding on the back of a turtle... until Atlas came along. An "angel" in scriptural lingo refers to an idea, thought, or strategy (similar to a con man's "angle"). And as it turns out there are three thoughts that provide proof of truth. There must be a unanimous vote of the three angels. The word "true" merely means "accurately aligned", usually referring to the alignment between a statement or claim and objective, physical reality. But then, how do I know that with certainty? Because nothing else is Relevant concerning a proposed truth (aka "I don't care about anything proposed as truth if it doesn't meet that standard") and I maintain that concern consistently and comprehensively. It is my Definition of "a truth" (thus "true by definition"). Years ago, I was surprised to see those angels appear in a small booklet given to a set of churches regarding the proper method for interpreting the Bible. The author expressed them as a means to check one's presumption of interpretation. I recognized them a little differently as not merely a means to know of a proper interpretation, but a means to know of the truth within any given ontology (the Bible being merely one and a different one than Science and thus one cannot intermix the elements). How can you know if what Physics says to be true, really is true? Faith in what you are told by a media service (a mediator)? Look merely for the definitions of the elements they propose and verify a unanimous vote of the "Three Angels of Truth". You will find that they don't know those angels very well and espouse some truths that aren't. And you can know it with certainty even without being a physicist ("don't mess with a good metaphyscist" ). 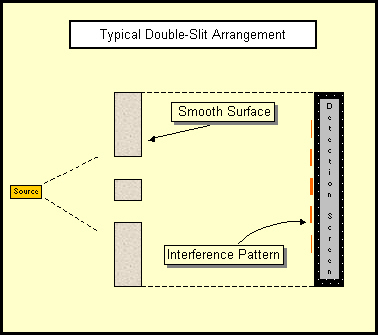 In the double-slit experiment concerning singularly generated particles, a double-slit screen is positioned between a particle source and a detection screen or device. The screen then displays what is seen as an “interference pattern” revealing the location of where each particle struck the screen after passing through the slits. For more than a century people have been confounded as to exactly why an interference pattern would appear when it seems impossible that any interference could exist. 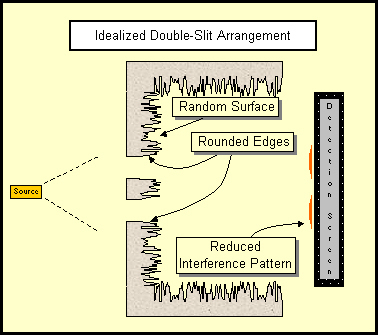 Using a new theory producing method, dubbed “RM”, and a new ontology, Affectance Ontology, I hypothesize that if the inner surface of the double-slit screen was altered to a specific surface shape, particles would no longer create a significant interference pattern, but waves still would. Since a photon seems as a particlized wave, I suspect that photons would show little difference from their typical interference pattern, as their inherent wave properties would still have predominate effect. But if they also stopped showing the interference pattern, it would indicate that photons really are strictly particles. Note that the inner walls of the screen must be randomized in height such that its greatest height is equal to or greater than the expected largest interference pattern wavelength. All inner walls should have a random surface. It would be good if the display screen was also shaped similarly, but such should not be necessary. To exist means to have affect. Thus the substance of the universe can be aptly named "affectance". An affect is a change upon something else. Thus to exist, there must be distinction in the substance of the universe. If the universe was totally homogeneous, void of distinction, nothing could affect anything else to any more degree than it was being affected by all else and thus all would remain as it was, an infinitely vast nothingness, never actually changing at all. Nothingness and total homogeneity are the same thing. To have infinite homogeneity or infinite similarity, there must be infinite similarity between every point in the universe. Using a Cartesian system, there are 3/4 * Pi * infinity^6 points in the entire universe. To have absolutely zero affectance in the universe (zero existence) would require that all of those points be infinitely similar. If we assign an affectance value of X to a point in space, every other point must be exactly equal to X. Each point has the possibility of being anywhere from 0 to infinite in its value. So the possibility of another point being that same X is 1/infinity. "1/infinity" is one infinitesimal, "0+", not zero. So the possibility of merely two points being exactly similar still isn't zero. So at this point, we can't say that there is no possibility of the universe being infinitely homogeneous. P = 0+^(3/4 * Pi * infinity^6 - 1), an infinitely, unimaginably smaller possibility than before... but still not exactly zero. But as long as n is any number, the possibility will still not be absolutely zero. And the truth is that n can be all but "absolute infinity". So, let's limit n to "the largest possible number" and call it "Largest". And that is how you discover that the universe has absolutely zero possibility whatsoever of not existing at any time. The universe could never have begun to exist because it could never have not existed in the first place. It is a mathematical impossibility. Nor can the universe suffer "entropy death" or "heat death" and the thought of such is merely a mild form of terrorism. The universe is made of spinning things, not bouncing things. Although that is not 100% true, when it comes to sub-atomic particles and atoms, it is certainly true. The Lorentz time dilation factor assumes the opposite. Considering a space ship traveling through space at 50,000 mph, how many particles and activities within the ship are spinning versus bouncing up and down? 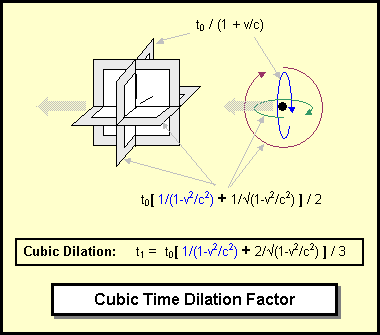 If you are not familiar with the Lorentz factor for time dilation, Wiki has an accurate article on it (warning: not everything in Wiki is). Time is merely the measure of relative change but an accurate measure of it can be tricky. It has always been assumed that it doesn't matter in what manner something is changing, but merely how fast. The problem is that change comes with directions of change as an inherent property. Thus when someone speaks of traveling in a direction, the relative changing within the object involves that direction of travel. The Lorentz transformation concerning time dilation for traveling objects assumes a photon bouncing between two mirrors. It is assumed that the speed of the light must be measured as the same for both an observer watching the traveling mirrors pass by as well as any observer on or in the traveling object. The issue is simply that the total distance of travel for the light will be perceived as different. The observer on the traveling object merely sees light bouncing directly up and down whereas the observer watching the object pass by sees that same light zigzagging up and down. Speed is merely distance over time. And due to the presumption that light must be observed as traveling at the same speed regardless of one's travel and the distance being traveled is seen as different, the measurement of time itself must change in order to compensate the distance difference and yield the same speed. The Lorentz factor was derived merely by calculating a factor that would provide such compensation. And a reflecting photon was used to produce that factor. If the universe was made of bouncing photons, it would have been a good model. But if one realizes that the universe is much more accurately modeled by spinning things rather than bouncing things, that compensating factor changes. In the following, I use a "square clock" to represent a spin rather than a round clock merely to simplify the mathematics. Whether round or square should not alter the compensation factor. What is important is that complete rotations are considered rather than linear reflections. In figure 1, a comparison is made concerning the observed distance of travel for the photon in a linear light-clock and a square light-clock. The green dot represents a photon traveling. If the square clock is observed passing by and the speed of that photon is to be constant, one revolution of the traveling clock must take longer than a stationary clock would have taken. The same is true for the linear clock. But the dilation factors for the two types of clocks are different. But the story doesn't stop there. Note that the square clock is turning in one particular orientation with respect to its travel. All rotations aren't aligned to the direction of travel. And given any spaceship type of scenario, within the ship, particles and atoms will involve rotations in all three dimensions regardless of the direction of motion. So for example, the Lorentz time dilation factor for an object traveling at 0.5 the speed of light is 0.8660. The Cubic dilation factor yields 0.8236 as a more accurate figure for real applications. For extremely precise calculations, the exact method for measuring time must be considered. The effect of "phantom photons" in the Mach-Zehner Interferometer. Phantom photons are formed whenever a photon is either blocked or reflected by any material. They are the result of extremely low energy affectance waves that cannot stop proceeding in a linear direction and are normally undetectable by photo-effect detectors. 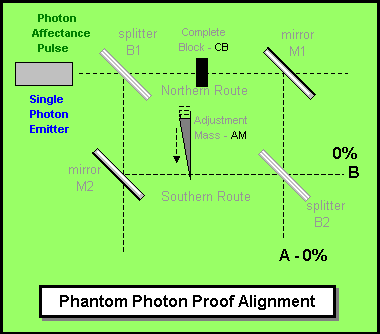 A "positive phantom" (shown as light green) is formed and passes through the material when the photon is reflected, such as with a mirror in the Mach-Zehner setup. 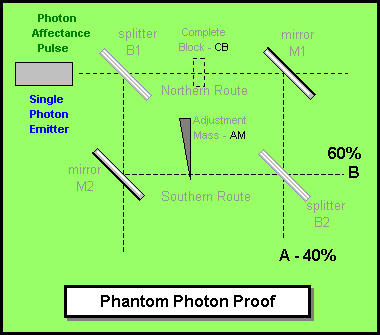 "Negative phantoms" are formed whenever the photon passes through the material, such as glass or a beam-splitter (shown as white). The existence of these phantoms explains the paradox involved in the single-photon Mach-Zehner experiment. And I think I figured out a means to prove the existence of phantom photons. According to both QM and TEW, both A and B should receive 50% of the photon stream. But according to JSSRM, B should receive slightly more than A and the amount is adjustable with AM. 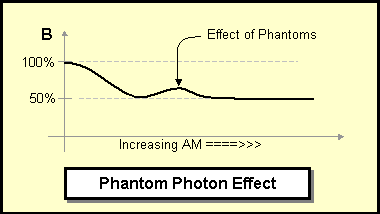 The hump in the graph noted as "Phantom Effect" should come about due to the phasing effects of the phantoms going through AM. I can't provide any measurement predictions for a variety of reasons, but that general pattern should become apparent if instructions are followed carefully.